According to the Chinese Horoscope 2019 for Pig or Boar, these natives will have ample freedom to act as they wish. In this way, you will be able to go through life acting in an optimistic and totally independent way. Pig natives must try to do things in the most appropriate way, showing flexibility when trying to achieve the objectives set. Although we have said that you can do things independently, the Chinese Horoscope 2019 for Pig or Boar recommends that it would not be superfluous for you to accept collaboration with other people. Therefore, it will be very interesting to create new social contacts to help you improve your development, both personal and professional. The positions that the stars will occupy will make it possible for you to do a harder job if you do it helped by more people. It can also result in a year in which they can use the opportunities that the Pig has to help other people only in their own interest. You must be careful not to be taken advantage of. Those who were born in the years 1911, 1923, 1935, 1943, 1947, 1959, 1971, 1983, 1995 and 2007 are part of this Horoscope. Without a doubt, it is a fantastic year at sentimental level for these natives. We should also not forget that we are in the year of the Pig. A kind of golden age in which it will be very attractive and will be very successful, thus satisfying almost all your personal desires. It is time to enjoy passionate, exciting and intense relationships, where you will discover new ways to satisfy your sexual desires. In the case of couples who are looking for a child, it will be the most appropriate time. This period, according to the Chinese Horoscope 2019 for Pig or Boar, means the opportunity to open up to new markets and look for customers different from the ones you usually deal with. You will have so much confidence in yourself that the ideas you suggest to your partners will be very well received thanks to the enthusiasm with which you defend them. From September to November, you will have to be careful with new contacts you know. You should avoid buying all those unnecessary goods, especially before starting the summer. In this way, you will keep the family economy in the right balance. A position that is advisable to maintain for at least the first half of the year. Your concern to keep the family in the best possible economic conditions will allow you to look for all kinds of interesting ideas that you will not have to spend a lot of money on. The members will thank you for it, thus further strengthening family ties. 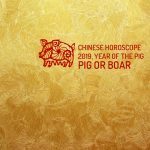 Therefore, the Chinese Horoscope 2019 for Pig or Boar forecasts a time when the natives will live with optimism, always acting independently, although they will also let themselves be helped by third parties.